With end-of-semester projects due and final exams looming, I find myself spending a lot of time wondering if it is ok to eat cake for breakfast. Just because I am studying nutrition does not mean I am immune to unhealthy eating habits like emotional eating. But what it does mean is that I can answer that question healthily. Can I eat cake for breakfast? 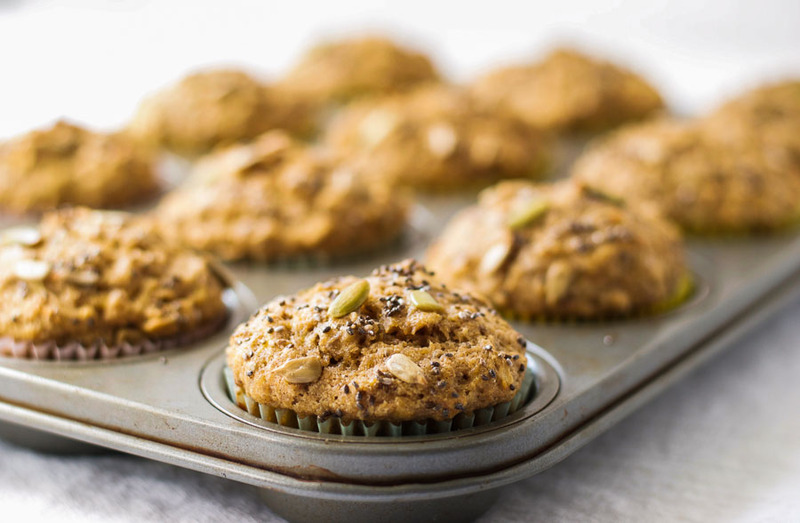 Yes if it is these healthy breakfast muffins masquerading as cake. Commercially available muffins are usually very high in calories and sugar. They are simply cake in disguise. For example, the blueberry muffin with yogurt and honey from Starbucks contains 380 calories and 30 grams of sugar (that is a whopping 7.5 teaspoons of sugar), and their chocolate chunk muffin contains 440 calories and 39 grams of sugar (almost 10 teaspoons of sugar). 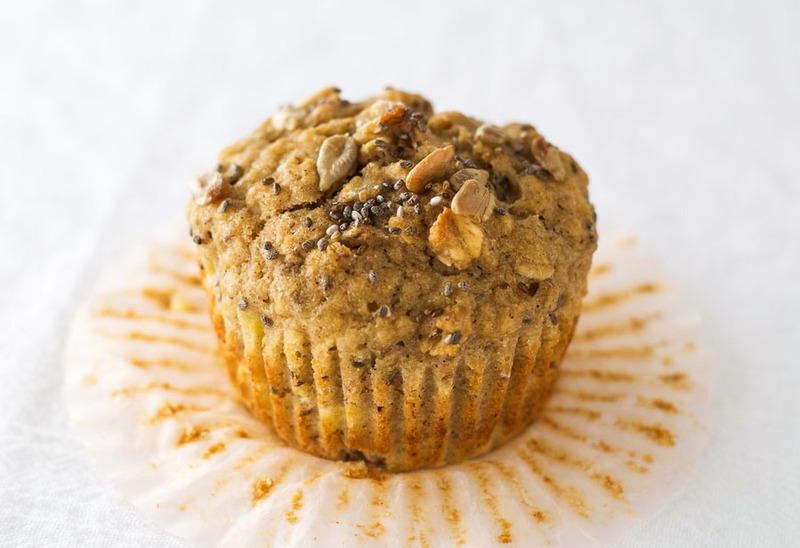 I wanted to create a muffin that could be eaten, guilt-free, as a nutritious and filling breakfast option. I wanted them to contain plenty of whole grains, protein, and healthy fats, but very little added sugar. 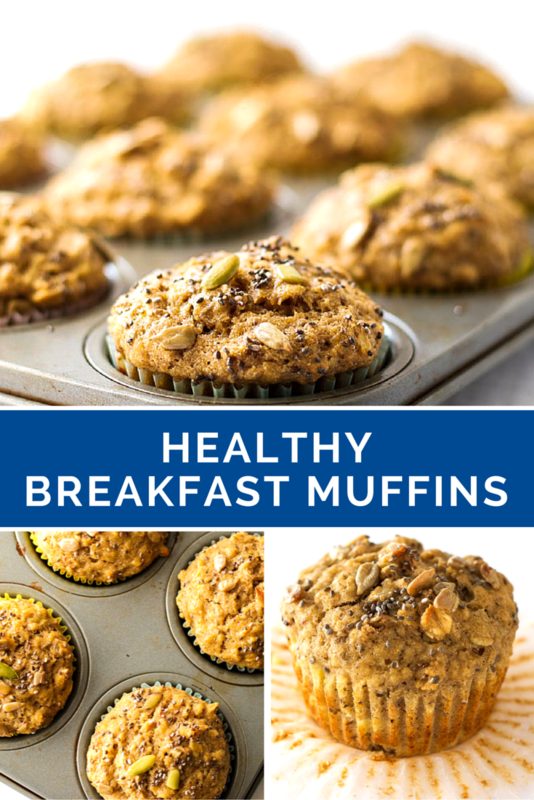 The result was these healthy breakfast muffins. They contain just 175 calories each and only 6.7 grams of sugar, most of which is natural sugar from bananas, applesauce, and yogurt. I added just a touch of honey to sweeten them up slightly. Although the ingredient list looks a little long, it really doesn’t take much time to put these muffins together. In one bowl you whisk all the wet ingredients. In another bowl you combine all the dry ingredients. You then pour the wet over the dry and stir until just combined (not too long or you will get heavy muffins). Put the mixture into a muffin pan, pop it in the oven, and Bob’s your uncle, breakfast is ready for the next few days. Unsurprisingly, even the children approved of eating cake for breakfast. Grease the cups of a standard 12-cup muffin pan, or line with muffin papers and lightly grease the papers. In a large bowl, mix together the whole wheat flour, all purpose flour, oats, baking powder, baking soda, salt, cinnamon, flax seed, and 2 tablespoons of the seeds. In a medium sized bowl, whisk the eggs, and add the yogurt, coconut oil, applesauce, mashed banana, honey, and vanilla extract. Stir well to combine. Pour the wet ingredients onto the dry ingredients and stir gently until just combined. Don't worry if the mixture is still slightly lumpy. It is important not to over-mix muffin batter. Fill the cups of the muffin pan with the mixture. They should be pretty full. 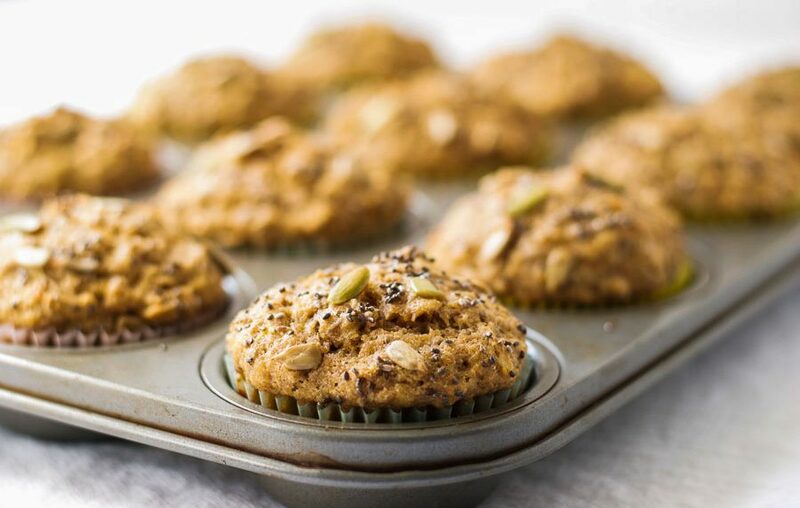 Sprinkle the remaining 1 tablespoon of seeds over the muffins. Bake in the oven for 20 minutes, or until a toothpick inserted into the middle of the muffins comes out clean. If using muffin papers, cool completely before removing the papers to stop them from sticking to the muffins. Tastes much better than sugar kaden corporate muffins, thx! I meant sugar laden. Sorry, hard to type while eating a muffin. 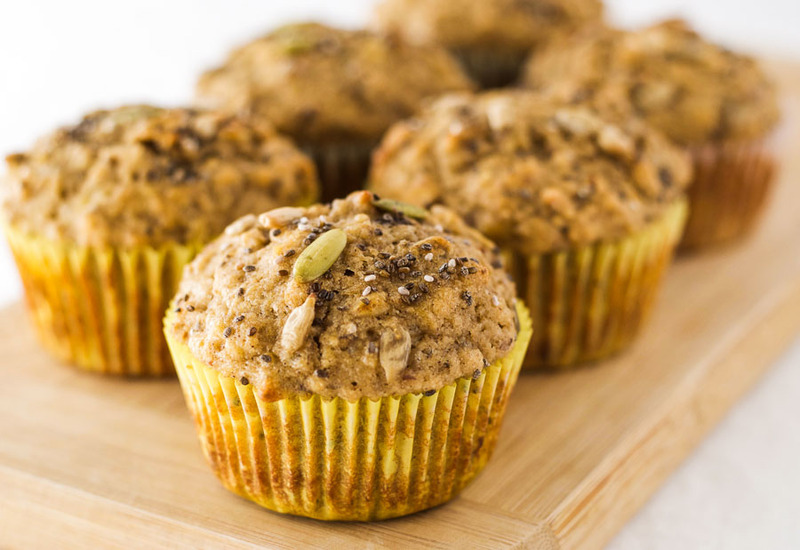 I LOVE muffins for breakfast – shame I don’t eat them often enough! Wow, Esther! 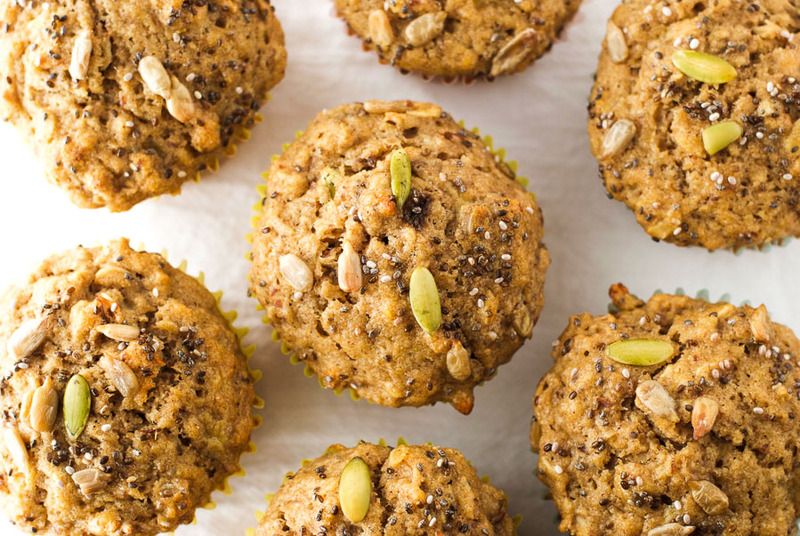 These look beautiful and love the addition of chia and seeds to the muffins! Perfect way to start the day. Pinning this one, too! These sound wonderful, but I can’t eat bananas. Could I substitute apples or applesauce ?